"Everyone else is doing it, why not?" 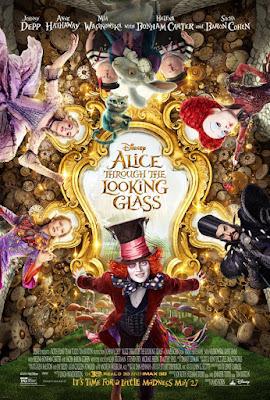 Alice Through The Looking Glass is a cross between a sequel and an en vogue origins film. Underneath it's somewhat monotonous yet very attractive abstract exterior, the film has some interesting and enjoyable character studies of those larger than life personalities made popular by Lewis Carroll in the 1800's. The Tim Burton directed 2010 film had people divided with many not enjoying the over the top spectacle created and the liberties that Disney took with the story and it's characters, while others were quite happy with the film's flamboyancy they felt it captured the true surreal nature of the original story itself. In the second Disney live-action Alice film, James Bobin takes over the reins from Tim Burton who 's presence is still greatly felt throughout the film as he steps into the role as producer. Alice Through The Looking Glass does not have much in common with the book in which it is based on, "Through The Looking Glass and What Alice Found" by Lewis Carroll. In fact, the original Disney animated Alice in Wonderland in 1951 draws more inspiration from this book than this 2016 film does. Disney took great liberties with the 2010 film, which was not entirely a bad thing as it breathed new life into the story that has been adapted many times for film. These liberties continue into the new film which means that the only aspects of it that resemble the book are it's title and that Alice does, funnily enough, re-enter Wonderland through a looking glass. Upon returning from her voyage as captain of the ship, the Wonder, Alice Kingsleigh (Mia Wasikowska) find herself still ridiculed for being a woman and is hardly taken seriously when trying to conduct business transactions. When she is starting to lose faith in herself and in the impossible, she is once again transported back to Wonderland through the looking glass and finds her friend, the Mad Hatter (Johnny Depp) in a terrible state. She is able to help him, but this requires going back in time and altering the past to stop Hatter falling into darkness in the future. Once again, the great focus on the Mad Hatter in this film does feel as though the filmmakers are trying to maximise the use of Johnny Depp. This is not saying that Depp does a bad job, but it is not a particularly complicated performance either. The relationship with the Hatter that Alice has and had in the first film is far from what Lewis Carroll had in mind when he wrote the book and this is one of the things that audiences found and will find problematic. Had the Mad Hatter been played by anyone else besides Depp would his part in these two films been as large? Quite possibly not. Yet with Tim Burton at the helm in 2010 he was always the obvious choice for the role. 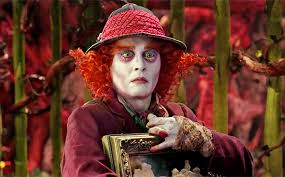 Even without Burton, if one had to name the working actor who would make the best Hatter in a live-action Alice in Wonderland, Depp's name would have immediately sprung to mind. However, the right casting of an actor who is known for his quirky roles as one of literature's quirkiest characters still does not do much to ease the uncomfortable thought that the character was reimagined purely to suit him. Had Alice Through The Looking Glass been purely an origins story about each of the characters and their backgrounds, it may have been a great deal more entertaining and enjoyable. The same can be said for if it was purely a sequel about what happened the next time Alice went to Wonderland. Yet it is the fact that it tries to do both of these things in one film that makes it weak as a whole. Bobin's film does try to be too many things which is where it's impact as a spectacle and as any type of emotional experience is lost. The flying back and forwards between time is not as much confusing as it is purely dizzying and irritating. However, the idea of Time being part man and part machine as portrayed by Sacha Baron Cohen is a clever one and is a great addition to the array of interesting characters that already exist in the film and makes the time travel bearable. With the characters come many opportunities for emotion and depth, particularly with the Mad Hatter's inner torment and between sisters, the Red Queen (Helena Bonham Carter) and the White Queen (Anne Hathaway). However, Depp, Carter and Hathaway do give the right amount of emotion for what is written into the story and none give a bad performance by any means, but any more tears or affection would actually seem out of place considering the lack of intensity in the film. 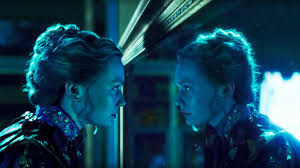 It is a shame because visually Alice Through The Looking Glass is extraordinary and often quite intense, particularly in the opening ocean scenes and when Alice is using the Chronosphere to transport herself back and forward through time. The production design for inside the world that is Wonderland and especially that of Time's castle is extraordinary and the use of colour is magnificent. Yet it is here in the visuals that Alice Through The Looking Glass's power is and not in the screenplay. Although screenwriter Linda Woolverton has attempted to make a film that is intended to be character driven, Bobin has neglected to take the time to allow the audience to sympathize and relate to the characters. However, Mia Wasikowska should be complimented on her obvious growth as an actress since her breakthrough role as Alice in the 2010 film. Even from the very first scene, she is a great deal more powerful in her delivery than in Alice in Wonderland and like all leading ladies should be, gives the best performance out of anybody in the film. One thing that both the earlier film and this one have tried to do is install a sense of independence into Alice and make her a good role model for young girls, which is something that Wasikowska has been able to accomplish. Any type of "Alice in Wonderland" adaptation is met with a certain sense of magic and despite the weak and busy screenplay, Alice Through The Looking Glass still maintains a whimsical air.